If you’re looking for journal prompts for kids to get your little ones excited about writing and keep your older kids inspired when they need a creative outlet, you’ve come to the right place. We’re sharing our best tips to get your kids started with journaling, and how to maintain their interest in creative writing long-term. We’ve also hand-picked 8 of the coolest journals for kids and a month’s worth of creative writing prompts for kids that are designed to help children focus on the positives in life, cultivate feelings of gratitude, and boost their self-esteem. With summer vacation fast approaching, I’ve been giving some thought to the kinds of activities my daughter and I can do together to ensure she keeps up with all of the amazing skills she learned in grade one this past year. I figure she’ll get enough in the way of physical activity at camp during the week, and we’ll likely spend the bulk of our weekends seeking refuge from the heat at our local splash pad, but I need to find ways to keep her love for reading, writing, and spelling up when we’re not outside soaking up some much-needed Vitamin D.
I’ve been thinking over all of the things she’s enjoyed doing at school this year, and one thing I keep coming back to is journaling. She was given a basic draw and write journal back in September, and while she had ZERO interest in anything to do with writing or spelling at the time, this is the one activity she looks forward to the most each day. My friend has continued this tradition with her own kids, and since journaling helps kids develop their reading, writing, spelling, grammar, and communication skills, and also teaches them about goal-setting and how to create a positive mindset, I’ve made a commitment to adopt this tradition for our family too, which is what prompted me to search out the best cool journals and inspiring journal prompts for kids. Journaling is often considered an adult thing to do, but kids of all ages can benefit from journal writing, and it’s a great habit to get your kids into when they’re young. Learning how to write our feelings out on paper can make a big difference in all of our lives, and teaching kids how to express themselves freely and work through their problems through their writing can be a very valuable life lesson. Improves writing and communication skills. It goes without saying that the more a child writes her thoughts out on paper, the better she will be at putting her emotions into words and communicating her needs to others, but what many of us don’t realize is that journals for kids also provide a fun and effective way for children to work on their writing, spelling, and grammar skills. Of course, a journal is meant to be a private, unedited place for stream-of-consciousness writing, but you will be surprised to see how your child’s skills improve when she continues to put pen to paper. Provides an outlet. Whether your child suffers from severe anxiety, or takes life in stride, there’s no denying that kids of all ages have worries, and journaling provides a fabulous outlet to help them address their feelings. Youngers kids will likely want to share their journal with you, but if your child chooses to keep her journal private, she’ll have a place to express herself freely without feeling as though she needs to censor her thoughts for the benefit of others. Promotes a sense of calm. Writing our thoughts out on paper forces us to come to terms with the things we’re feeling, and while this may initially cause your child to feel anxious, stressed, sad, or ashamed, working through her thoughts will typically bring her back to a state of calm. Provides solutions. 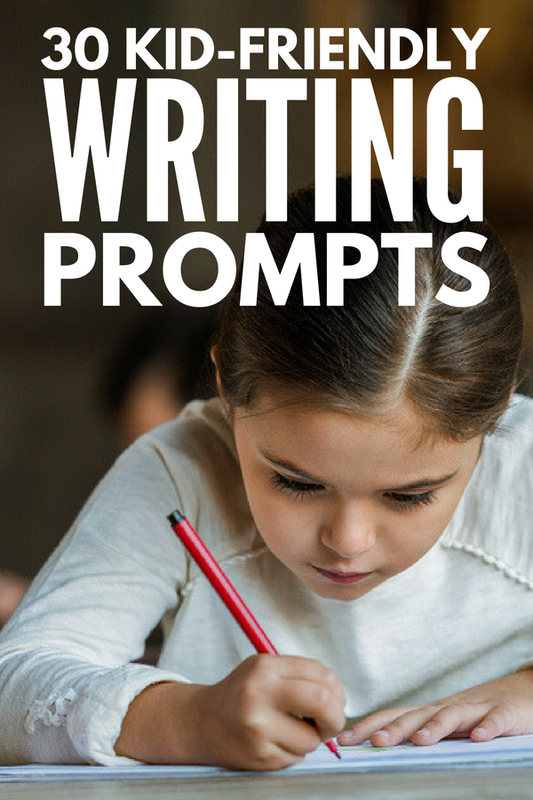 There are tons of journal prompts for kids (see below!) that are designed to help children think outside of their comfort zones, and as your child writes, she will inevitably start to come up with solutions to her problems. The benefits of journal writing for kids cannot be ignored, and if you want to encourage your child to incorporate writing into her daily routine, make sure she takes it slow and keeps at it. Remind her that journaling should never feel overwhelming, and that her writing is not meant to be perfect. Explain to your child that a journal is simply a place where she can record her thoughts and feelings, and she doesn’t have to share her writing with others unless she wants to. Choose a journal format. With so many types of journals to choose from (see below for some of our favorites), it really can be overwhelming choosing the right kid’s journal for your child. My suggestion is to encourage your child to choose a plain notebook to begin with – she can always move to a guided journal like the ones outlined a bit later in this post once she has an idea of the direction she’d like to take through her writing. Opt for a fun notebook (boys will love this LEGO-inspired notebook, and girls usually like diaries with locks), and don’t be afraid to let your child buy some colored pens to decorate the pages of her journal and help boost her mood while she’s writing. Make it fun. When it comes to journal writing for kids, you want to find ways to make it as fun and engaging as possible. Younger kids may get more out of one of the cool journals for kids we’ve recommended below, whereas older children will appreciate guided journal prompts for kids to help inspire them on days they don’t know what to write about. Write each idea on a popsicle stick and create your own ‘journal prompts for kids’ jar your child can draw from each time she’s stuck and doesn’t know what to write about. Make it a family activity. Another great way to get kids excited about journaling is to make it a family affair. You can choose a journal to complete together (see below for Mom and Me Journal ideas), or set aside time to work side-by-side to get your thoughts on paper at the end of the day. Set a timer. A good way to keep children interested in journaling is to set a time limit of 5 or 10 minutes each day for them to get their thoughts down on paper. Leaving it open-ended can feel too daunting to kids, especially if they’re younger, but if you have a set time, your child will be more likely to focus and get more out of the time she spends writing. Re-read old entries. Whether you and your child are journaling together, or separately, taking the time to periodically look back over older entries can be really cool. It’s a great way for kids to see how their writing has improved, and reading through past thoughts and feelings can provide a lot of useful insight. Gratitude Journal. Described as a ‘toothbrush for the mind’, The Five-Minute Journal for Kids is a great kid’s journal for beginners as it doesn’t take a lot of time to complete, but helps get kids into the habit of carving out time each day to jot their thoughts on paper. The Five-Minute Journal is unique in that it designed to train our brains to begin and end each day with feelings of happiness and positivity. By encouraging our children to focus on the good in their lives, we help improve their mental well-being by steering them away from negative thoughts. The Five-Minute Journal is also available for adults, so you can purchase a set for the entire family and make it a ritual you complete together at the start and end of each day. Learn more about The Five-Minute Journal for Kids HERE. Mom and Me Journal. If you’re looking for a way to connect with your child, one of my favorite cool journals for kids is one you complete together. There are tons you can buy online – Just Between Us: Mother & Daughter and Between Mom and Me: Mother Son Journal are both great – and they provide wonderful opportunities for you to discuss lots of fun topics with your child to help you get to know one another a little better. They contain journal prompts for kids and parents as well as fun quizzes, blank pages to draw pictures on, and lined pages to write fun lists together. Fill in Journal. Not all kids are designed to write long-form journal entries, and that’s 100% okay! Whether your child is too young for a formal journal, has trouble focusing for long periods of time, or struggles with low self-esteem, Me: A Compendium might be just the kind of kid’s journal you’re looking for. It’s filled with a bunch of fill-in-the-blanks ranging from a child’s description of herself to her likes and dislikes, and is designed to encourage creativity with space to draw pictures. Get your copy HERE. Draw and Write Journal. As I mentioned earlier, my daughter has been keeping a draw and write journal at school since she started first grade in September, and it’s her most favorite activity to do each day. Since she’s only 7, the exercise is pretty open-ended, and the only ‘rule’ she must follow is that she has to write a complete sentence each time she writes in her journal. My daughter wasn’t much of a writer prior to grade 1, but each time she fills an entire journal and brings it home to show me, the 2 of us take great delight going through all of her entries together, and it’s been really cool watching her writing and drawing improve over the weeks and months. Scrapbook journals. If your child is artistically inclined, scrapbooking is a great activity to get them involved with as it provides a great creative outlet and gives them a place to collect and reflect over their best memories as they grow. Beginners will probably need a scrapbook kit to get them going, but as your child gets older, let them choose a notebook and some gel pens, and then watch as they work with other materials already available to them at home. Vacation journal. Whether you’re planning a big family trip, or simply want to find ways to keep your kids busy during a summer staycation, another one of my favorite cool journals for kids is a vacation journal. Vacation journals offer a place for kids to write lists – what to pack, what to do, what to see – as well as record their memories, making the experience extra special and exciting. Question a day journal. When it comes to cool journals for kids, Q&A a Day for Kids is another option I love. It’s a 3-year journal you can complete together, or give to your child to fill in independently, and it makes for a great keepsake as you can compare your child’s answers to the same questions year over year to see how much they’ve evolved and matured. Writing prompts journal. Older kids, children with big emotions, and those who need help developing their writing, spelling, grammar, and communication skills will benefit greatly from writing their thoughts in a blank notebook each day (consider buying your child a diary with a lock for added privacy), and if they have trouble coming up with things to say, we have a month’s worth of writing prompts to inspire your child below. You can go in order, or write each idea on a popsicle stick and create your own ‘journal prompts for kids’ jar your child can draw from each time she’s stuck and doesn’t know what to write about. 1. Describe your perfect day – who would you spend it with and what would you do? 2. Identify one thing you are looking forward this week, and explain why it makes you feel excited. 3. What makes you feel happy when you’re sad? 4. Discuss one thing that happened today that made you happy. 5. What words do you wish someone would say to you when you’re having a tough time? 6. Discuss 3 things you did RIGHT today. 7. Write a list of 10 things you are thankful for. 8. Describe a situation in which you helped someone else. What did you do? How did it make them feel? How did it make you feel? 9. Describe your favorite time of year. What do you love about it, who do you spend it with, and what activities do you enjoy during that time? 10. What is your biggest talent? 11. Write about something cool you learned this week? 12. Which person are you most grateful for in your life? Describe the parts of this person that make you happy. 13. What is your favorite thing to do after school? Why do you enjoy it? 14. What is the best gift you ever received. Who gave it to you and why did it make you so happy? 15. What’s your favorite TV show? 17. What is your favorite activity to do on the weekends? 18. What makes you special? 19. What is your favorite season of the year, and why do you like it so much? 21. Who is your favorite superhero and what do you like about him/her? 22. What is your favorite food in the whole wide world? 23. Describe your best vacation. Where did you go? What did you do? 24. If you could change one thing about the world, what would you choose? 25. Describe a time you did something that made you scared. How did you get through it? How did you feel afterward? 26. If a genie granted you 3 wishes, what would you ask for? 27. What is your favorite toy and what do you love about it? 28. If you could have ONE super power, what would you choose? 29. What is your favorite part of the school day? 30. What is the bravest thing you’ve ever done? Whether you’re looking for journal prompts for kids to use in the classroom, as part of ongoing therapy, or as an after school or summer activity to enjoy with your children, I hope the tips and ideas in this post prove useful to you! If you and your kids enjoyed this collection of journal prompts for kids, please share this post on Pinterest! And if you’re looking for MORE ways to have fun with your kids this summer, please follow our KIDS board where we share all kinds of great ideas we find each day!